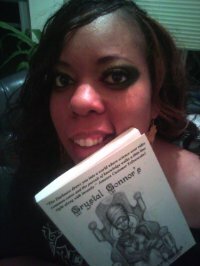 Today Psychotic State Book Reviews welcomes Crystal Connor, author of the newly released The Darkness. Welcome, Crystal! Thank you, Crystal, for sharing your writing with us. So, readers . . . what color are you? 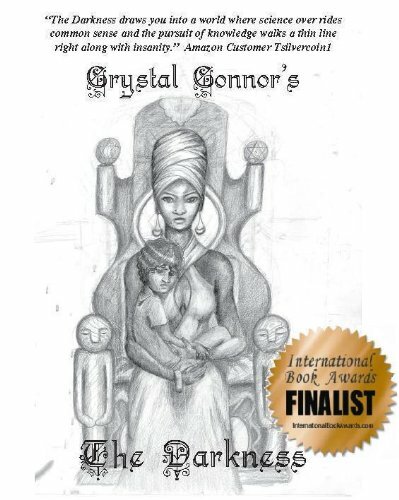 The Darkness has been selected as a two time Award-Winning Finalist in the 2011 International Book Awards in the fiction categories of Cross Genre Fiction and Multicultural Fiction! Artemisia, a scientist who also practices alchemy, is wealthy beyond imagination. She is one of the founding members of the Skyward Group, a privately funded, secret, research facility conducting experiments that erase what tradition has established as the boundaries separating the realm of man from the realm of God. Artemisia has everything she wants - money, fame, knowledge and power - except for a child. Inanna is a powerful and dangerous witch, also wealthy beyond imagination. Her powers are greater and more deadly than any in the long tradition before her. Inanna has everything she wants - money, knowledge and God-like power - except for a child. The Child has nothing. At three months of age, he knows only what he has experienced through the bars of his locked cage. He has nothing. He doesn't have a mommy. He doesn't have a daddy. He doesn't have a name. The scientists who created him do not handle him, because they know The Child is dangerous. In The Darkness, Two women clash in a vicious battle that has been fought since the days of King Solomon - the fight over a child. One woman unleashes the nightmarish arsenal of modern science while the other dispatches the weaponries of witchcraft. And as The Child grows up, his love for one and resentment for the other will change the fate of both these women, forever. Good reviews of books you have there. Continue to blog to inspire others.